KAF explained the arrangements that he made for SAEEA 8th Reunion/Eid Milan at “Village Restaurant” in Karachi. SAEEA three active Members are out of Country; so, he requested Manzoor Shaikh, Younus Shaikh and Salim Hamid for their assistance during the function. Two pane flex were made and were displayed for all the attendees. The same will be ready to fix in the event place on the function day. The attendees liked the new design of the SAEEA on the pane flex. It was agreed that as soon as the 8th Reunion Function is over MAM and SAK to arrange 9th reunion function in a Farm House, closest to Karachi. 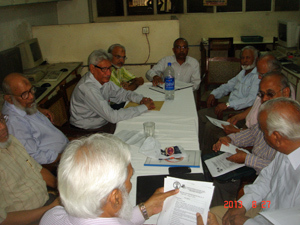 They will survey the place and will submit a report for their views in the next SAEEA Progress Meeting. 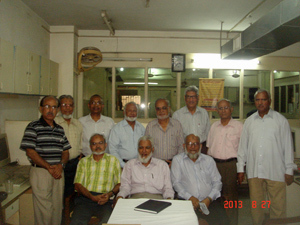 KAF inform all the volunteers about their assignments during the reunion function on the August 31, 2013. Mr. Rais Akhtar-Chairman Election Committee inform all the attendees the procedure the committee is going to follow for conducting the election on August 31, 2013. He requested all the assistance from all the members to perform the said task successfully. KAF made dua for forgiveness of the father, who died in Karachi on August 26, 2013, of Syed Qutubuddin Khan the gentleman assisted SAEEA in getting the website developed. Further he made dua for all the sick members of SAEEA for their fast recovery. Please contact Engr. Iqbal Ahmed Khan on +92-321-701-4929 or write to him on [email protected] if you have any question. For more details please visit the official website of SAEEA the URL is http://www.saeea.com.pk.